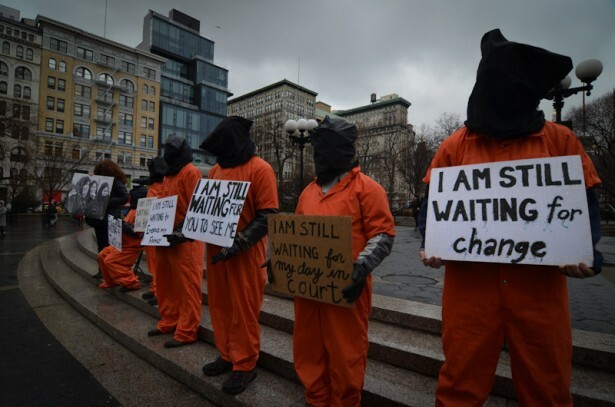 Dozens of men at Guantánamo are on hunger strike, having given up one of their last joys in order to protest their suffering, indefinite detention and ongoing abuse. All over the country, my friends are fasting. This whole week, they are turning away from food. I am sure that more than 100 people are refusing to eat this week. They began on Sunday, March 24 and will break their fast on Saturday, March 30. They are doing this because dozens of men at Guantánamo are on hunger strike. They are losing weight, losing consciousness and enduring force feeding. Lawyers who represent the men are worried they might die. The military officials at Guantánamo will work hard to keep that from happening. They will shove tubes up their noses and pump their bodies full of nutrients. But they will not release these men — most of whom have been cleared of any wrongdoing by both the Bush and Obama administrations. The solidarity fast in the United States was launched by Witness Against Torture, which — myself included — has been working to close Guantánamo since 2005. We are also calling on people of conscience and good will to hold demonstrations and vigils this week. The goal is to make Guantánamo visible. And so we also want people to call the White House, the Department of Defense and Southern Command (which oversees the U.S. Naval Base at Guantánamo). Tell them you are concerned about the hunger strikers — people who are unjustly and indefinitely detained. It has been a very full week. We’ve spent lots of time on hold; lots of time redialing the White House; lots of time drafting press releases and helping reporters find people to interview; lots of time reading about Guantánamo; lots of time appreciating my friends and wishing I could be with them. See, I am doing all this work, and encouraging other people who are fasting. But, I am not fasting. I am nursing a fat baby. I am doing it right now as I type. Sometimes, even though I eat all the time, I wake up in the middle of the night hungry, so hungry. I am not fasting this week, but I am trying to be mindful as I eat. I think about what a simple joy it is to eat, to be nourished and sustained, to be alive. And I think about the men at Guantánamo, who have so little that is beautiful and joyful and who gave up one of their last joys in order to protest, in order to be heard. They are trying to end their suffering, indefinite detention and ongoing abuse. But the only way they can do that is to heap more suffering onto their heads. Some of the men who are on hunger strike at Guantánamo have been there for more than 10 years. That’s 10 years without charge, without trial, without sentencing. Ten years without seeing their children, their wives, their homes. As I read this, I thought about how much my son Seamus misses his dad every day. By the time Patrick hangs up his coat, Seamus is windmilling himself out of my arms, eager to be reunited with a father who has been gone six or eight hours tops. Ten-plus years is unconscionable. Thank you. That means a lot to us. So does a homemade lantern. Fayiz Mohammad al Kandry sent us a message through his lawyer: “I made this lantern with my brothers. It’s made with bits of paper and cardboard. We used a water bottle sanded on the floor as glass. We painted it with bits of paint and fruit juice. It’s held together by pressure only. We made this lantern for those in the world who remember and pray for us during this time of suffering. Let its light fill you. Use it to bring peace to your heart. Thank you.” Fayiz is from Kuwait. He has been at Guantánamo for more than 10 years. He and his lawyers fear he will be there forever. He is one of the men on hunger strike. I am not fasting. But today is Good Friday, and so I put on my orange jumpsuit and black hood and went down to the Navy base in Groton for the Stations of the Cross. I thought about Johina and Shaker and Fayiz. I thought about a man tortured and executed by the state some 2,000 years ago. Beneath my hood, I watched sturdy tulips push up through the ground. I watched Seamus and Rosena play with their dad at the edge of the vigil. I gave thanks for joy and beauty and my friends who are ending their fast on Saturday. And I prayed for justice. The safety and health of the detainees at Guantanamo are in jeapody now more than ever before. We fear something horrible may happen now that over 100 are not eating and many are being force fed in cruel manners. Your protests are necessary now more than ever. Stay in touch daily with Witness Against Torture at our website: http://www.witnesstorture.org Make phone calls and send letters. Vigil locally. Spread the world!